Artist Macarena Peña showcased at her artwork until Oct. 19 at IMAS in McAllen. Peña lost her sight in 1999, and hopes to serve as an inspiration to others. Typically, artists use paint brushes of different sizes and textures to complete their pieces. However, local artist Macarena Peña is anything but typical. Peña, who lost her sight in 1999 due to complications from diabetes, uses her fingertips to achieve the unique gradients and textures seen in her paintings. A mother of two young children, she needed to quickly adapt to her new condition in order to provide for them. “When my kids were small, they didn’t understand my condition; they still expected ‘mommy’ to continue doing everything for them, so that pushed me to relearn how to do all of the things I used to do,” Peña said. For the last 10 years, she has been teaching other blind people how to regain their independence as a teacher at Texas Workforce Solutions Vocational Rehabilitation Services. She teaches individuals how to perform tasks that many might take for granted, such as telling time, cooking, using appliances, monitoring their finances, building a resume and tactfully disclosing their visual disability to their employers, in the hope that they may rejoin the workforce. Even Peña, who often states that blind people are capable of anything, didn’t always know that painting could be a realistic hobby. She first began painting in 1997, but after losing her sight in 1999 she was forced to put her paintbrushes down. It wasn’t until 2015 when she hesitantly accompanied a colleague to an art class — taught by a visually impaired woman — that she painted her first piece after a 15-year hiatus. She immediately fell back in love with the craft, and now takes art class with Monica Ramirez. Ramirez owns a private art studio in McAllen and has taught art classes for more than 30 years. In the last two years she began teaching people with disabilities ranging from blindness to cerebral palsy. She opened her studio to students with special needs after noticing a lack of activities for adults with disabilities. Ramirez said these people are often overlooked in the community. As president of the National Federation of the Blind’s Rio Grande Valley chapter (NFB), Peña works to dismantle those types of barriers for blind people in the Valley. One of the biggest obstacles for them is to be acknowledged by others — an issue Peña likes to combat through dialogue, she said. She particularly detests the notion that blind people feel indifferent about aesthetic. “People think because we’re blind we don’t care about going shopping, going to the movies or about appearance, but that’s not true,” she said after reapplying her lipstick. In an effort to address those types of misconceptions in the community, NFB claims October as “Meet the Blind Month,” and hosts activities so the public can get to know the blind people in their communities. A kick-off event took place Oct. 1 at Cine El Rey in downtown McAllen, where community members participated in a blindfolded walk and watched a screening of the documentary, “Do you dream in color?” which follows the story of four blind young adults. From 6 to 9 p.m. on Thursday, Oct. 26, NFB will host its annual Visual Challenges Art Exhibit at Zucca Italian Restaurant in McAllen. The fundraiser invites local artists to create paintings blindfolded, which are later sold in a silent auction. However, Peña’s most effective tool for addressing misconceptions about the blind continues to be her artwork. 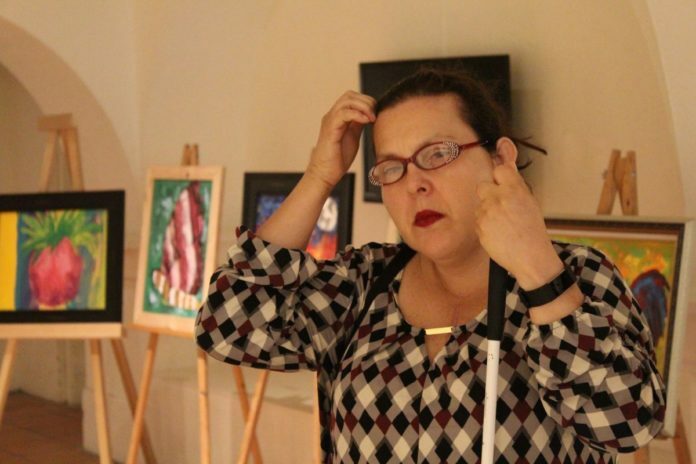 On Oct. 15, she showcased her exhibit, “Visions of the Heart,” at the International Museum of Art and Science, as a part of “Meet the Blind Day.” The exhibit ran through Oct. 19. And when a color has a name that doesn’t quite ring a bell, she simply asks her husband or a relative to help remind her of something she may have worn that was in that hue. One painting in her Mexican-themed collection is a profile of a black bull with a red gradient background, which she said brings her fond memories of her childhood and the bull fights her father would participate in Mexico. Unlike most artists, Peña encourages observers to touch her paintings, and incorporates textures that allow viewers to experience her paintings the same way she does — with their hands. Peña sees her success as an artist not as a testament of her own merit but as an opportunity to encourage others to untap their potential.